Home / Blog / We Do / Integrate API SMS Service into Your WordPress Website! One of the keys to success of any business and especially online business is on-the-spot responsiveness to the clients’ needs. We have repeatedly emphasized how much an app for small business can enhance interaction between the business itself and the customers. Though, there are some other solutions which can, to some extent, make up for the absence of a mobile app. Among these solutions are the messaging platforms offering various SMS services, that boost mobile communication. Implementation of such services is done via integration of SMS API for website provided by the messaging platforms. Integration of SMS API can be a smart supplement to the common practice of cooperating with the SMTP provider, that facilitates marketing emailing and messaging. One of our customers requested implementation of the SMS feature into his WordPress website, that would allow to send messages left by the users through the Contact form directly to his cell-phone. Thus, he can keep in touch with the visitors of the website during any time of the day and in case of emergency respond to them quickly or pass the needed issue for further investigation. Below you can find SMS API’s which can be used to integrate SMS from Contact form and other messaging features into your website. SMSAPI is one of the most popular SMS service providers for web application with more than 35 000 satisfied users. One of the obvious benefits of SMSAPI is its free trial period, so one can make sure that this very API fits their expectations before paying for its usage and only then make a decision on whether to pay for it or not. It also offers personalized messaging from the website to the customers and SMS notification of admins in case of server issues. In general, being well-supported, SMSAPI appears to be simple-to-use and dependable. Another well-known tool, that facilitates messaging services is a cloud communications platform Twilio operating in 180 countries around the globe. Some of the services the platform provides allow to send SMS from website, send account notifications, SMS sales and order notifications. Our developers claim judging from their own experience, that Twilio has good documentation and can be utilized in web application development of any kind. 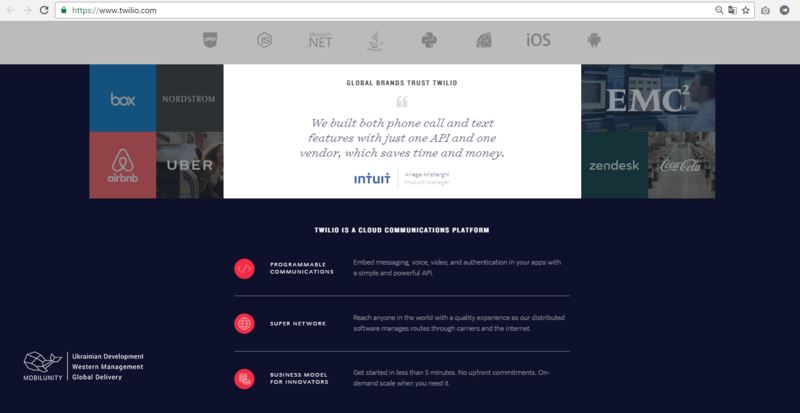 Moreover, Twilio services are considered to be rather cheap as opposed to other messaging providers. If you are running a WordPress website, WP plugin can always come to your aid and become a great SMS service provider for website. WordPress SMS is a convenient plugin to equip your website with messaging functions. It’s being constantly upgraded and updated, and can be downloaded from WordPress repository for free. It is currently operating on the basis of over 30 messaging gateways including Twilio, so there is no need to customly build SMS gateway into the website. The plugin itself offers a number of features like SMS notifications of different kinds and newsletters. Besides this, one can find recommended integrations in the description of the plugin, that will enrich its functionality to suit specific business niches. Even if for now one can’t afford development of a custom mobile application for their business, the alternative exists – integration of messaging platform API’s will keep you in touch with the customers on the go 24/7. Make use of Mobilunity solutions and boost your communication with the customers!